The Martinique Bedroom California King Bedroom Group by New Classic at Carolina Direct in the Greenville, Spartanburg, Anderson, Upstate, Simpsonville, Clemson, SC area. Product availability may vary. Contact us for the most current availability on this product. Drawer/Shelf Construction 100% Wooden Drawers; 5 piece drawer boxes with 4 corner dovetail and finished interiors. Felt lined top drawers in dresser and chest. Case Construction Composed of select hardwood solids and veneers. Solid case bottoms on all pieces. 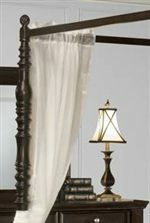 This bedroom collection lends a whisper of the islands with its timeworn, casual style to create a transitional design. 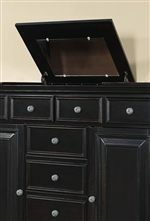 Rubbed black finish accents the fluted and turned post details of the veneer and solid cases. Featuring both panel and canopy beds this collection surely has an arrangement to fit your preferences. Raised panels and framed drawers along with distinctive mouldings complete a traditional influence. Pewter finished hardware adds a polished touch to complete this collection. The Martinique Bedroom collection is a great option if you are looking for Transitional furniture in the Greenville, Spartanburg, Anderson, Upstate, Simpsonville, Clemson, SC area. 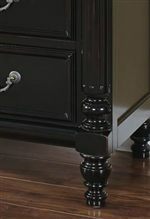 Browse other items in the Martinique Bedroom collection from Carolina Direct in the Greenville, Spartanburg, Anderson, Upstate, Simpsonville, Clemson, SC area.